Is your foal at risk for Developmental Orthopedic Disorders (DOD's) ? Foal-Aide® Paste by BUCKEYE® Nutrition is a scientifically formulated vitamin and mineral supplement created to complement your mare's milk, supporting rapid growth and development for your foal. Give each foal 3 cc of this paste per 100 lbs. of bodyweight per day. 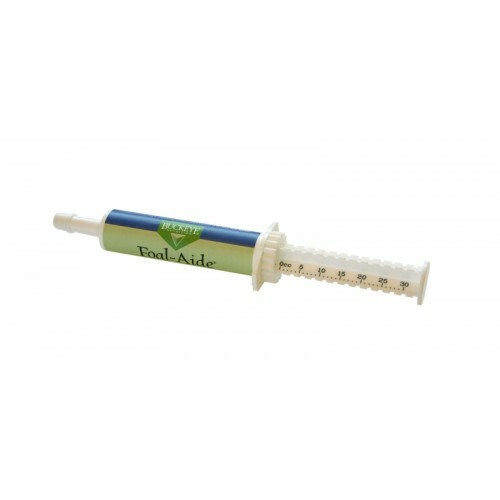 Start using Foal-Aide® at one week of age if needed. Continue until the foal is consuming recommended amount of Foal Starter. Sucrose, Vitamin A Supplement, d-activated Animal Sterol (source of Vitamin D3), Vitamin E Supplement, Ascorbic Acid, Vitamin B12 Supplement, Choline Chloride, Riboflavin Supplement, Niacin Supplement, Calcium Pantothenate, Thiamine Mononitrate, Folic Acid, Pyridoxine Hydrochloride, Biotin, Polysaccharide Complex of Zinc, Polysaccharide Complex of Manganese, Polysaccharide Complex of Copper, Calcium Carbonate, Sodium Selenite, Silicon Dioxide, Artificial Color, Natural and Artificial Flavors, Soybean Oil.